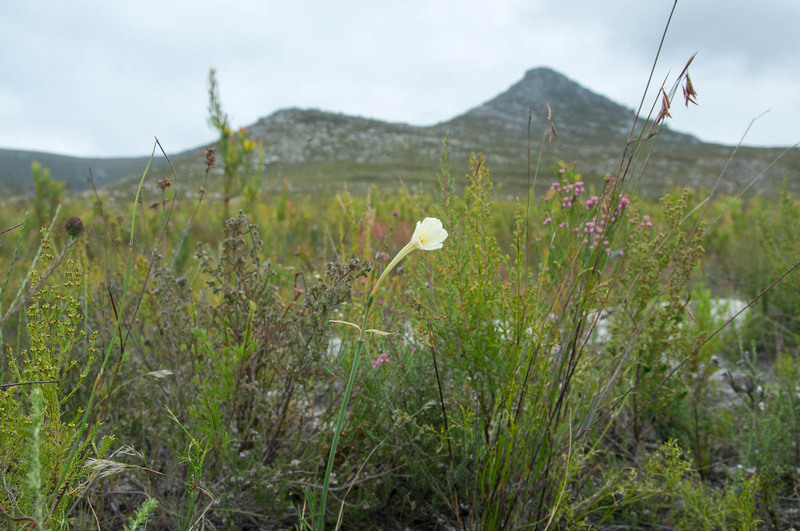 The fynbos is remarkable not just for its diversity but for the number of rare plants. 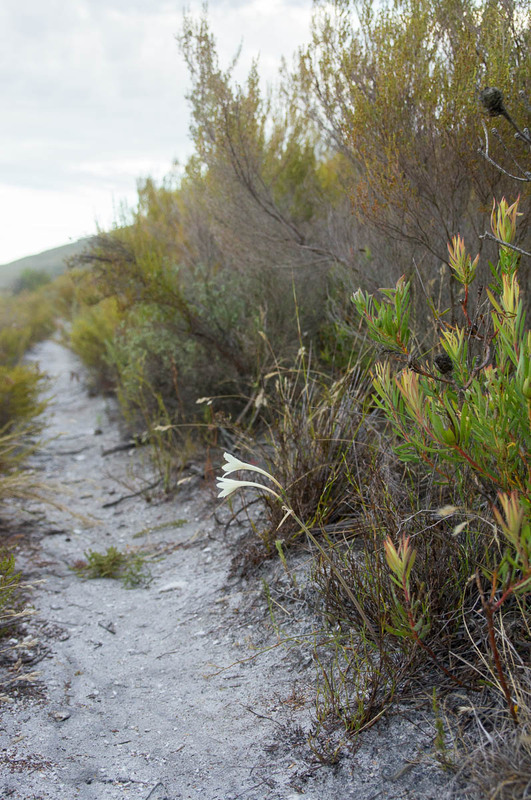 Many plants in fynbos are restricted to small areas. One of these is Cyrtanthus leucanthus, a member of the amaryllis family, Amaryllidaceae. It is only found in fynbos near the coast between Betty’s Bay and De Hoop Nature Reserve. It is found on the lower slopes of sandstone ridges, producing creamy white funnel-shaped flowers in the heat of summer (January and February). When plants with restricted ranges grow in areas that are threatened by development or alien plants then there is a risk of the species going extinct. These plants are assessed for the Red List of South African Plants and given a category based upon their risk status. The areas where Cyrtanthus leucanthus grows have been subject to much development. Betty’s Bay, Kleinmond, Onrus and Hermanus have all grown in recent years, putting great pressure on the remaining patches of lowland fynbos near the coast. Furthermore, the encroachment of alien plants into the natural veld further threatens the populations away from the towns. Cyrtanthus leucanthus has therefore been classified as Endangered, as it is known from less than 20 populations along the coastal belt. Adding to the problems that Cyrtanthus leucanthus faces is that where it does grow, it is never prolific. The plants themselves generally produce a single, or maybe two, flowers per bulb. Furthermore, they only flower sporadically, mainly after a fire. We have found five plants at Phillipskop. The first year we arrived, just a single plant flowered. We saw no flowers last year. This year, we have seen a further four plants in flower. All these plants have flowered alongside paths or in areas where the vegetation has been cut for firebreaks. It is likely that when a fire does burn the vegetation here, other plants will become visible. 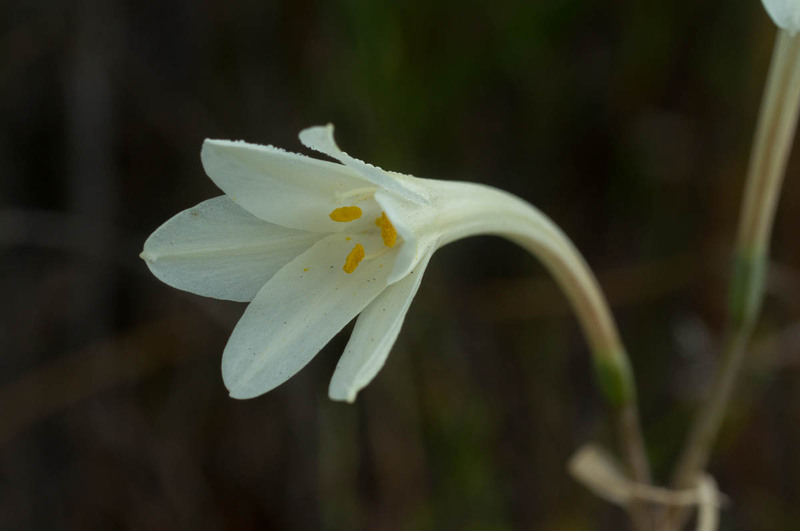 Nevertheless, it is not a common bulb and when it produces so few flowers, it is difficult for the plants to regenerate should habitat be lost. Amaryllidaceae, bulb, Cyrtanthus, Cyrtanthus leucanthus, Endangered, February, fire lily, geophyte, January, redlist, summer. Bookmark.